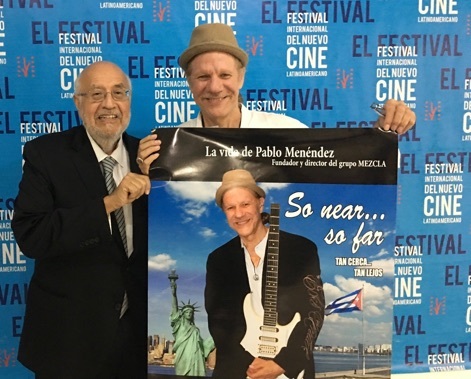 Los Angeles activist, David Sandoval has put in years on the documentary called “So Near…So Far,” the life of Pablo Menendez, founder and director of the music group Mezcla. Pablo was dedicated, in much the way Samuel of the Bible was dedicated, by his mother, Bay Area folk singer Barbara Dane, to the Cuban Revolution and in 1966, at 14 he moved there. He enrolled in the Escuela National de Arte. Living in the dormitory, his tuition, rent, medical care, laundry were all taken care of. He studied music and learned Spanish well enough to acquire a Cuban accent. One year later, at the age of 15, he married Adria Santana, a drama student, who became an internationally known Spanish-language actress. He has become “part of the local scenery”, an indelible part of many Cuban music scenes over the past decades: the Nueva Trova movement (Grupo de Experimentación Sonora with Silvio Rodríguez and Pablo Milanés), the jazz world (Sonido Contemporaneo at the old Club Rio with Gonzalo Rubalcaba and others), Afro-rock group Síntesis (with Carlos and Ele Alfonso) and more. ion and various members of Congress mobilized to protest. 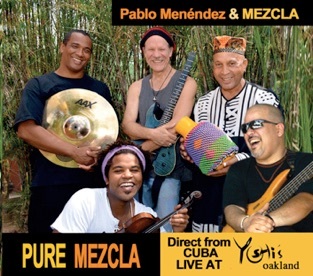 Among the protesters was the legendary guitarist Carlos Santana, the spearhead of Latin Rock, who stated in an interview with the San Francisco Examiner that Mezcla was his favorite band from Cuba. Mezcla is a multigenerational ensemble bringing together several veteran masters with some the best of young jazz players on the scene today. To watch this doc in an audience of friends and fans of Pablo, whom we had visited at his home two years ago, was a special treat of the festival. Seeing him later around town, especially at the Jazz Festival and at the Síntesis concert given in the Cathedral Plaza of Old Havana resonated deeply with my feelings for Cuba as a familiar and yet mysterious place.